Hillary Clinton jumped 5 percentage points in a head-to-head matchup with Donald Trump over the weekend, even though voters think Trump would do more to grow the economy if he is elected president, according to a new Morning Consult poll. Well over two-fifths of registered voters (44 percent) said they would choose the presumptive Democratic nominee if the presidential election were held now, while 39 percent said they would choose Trump. Almost one-fifth of respondents (18 percent) don’t know or have no opinion. It’s a 3-point gain for Clinton, who had lost ground in our previous poll following the mass shooting at Pulse, a gay nightclub in Orlando. When voters were also given a third choice, Libertarian candidate Gary Johnson, Clinton was the first choice for 39 percent of respondents, compared with 36 percent for Trump. Johnson pulled in 11 percent of support, a slight uptick from previous weeks, and 13 percent of voters were undecided. In broad economic terms, voters see Clinton as supportive of policies that would help their own families, the middle class and low-income people. They see the GOP’s likely nominee, on the other hand, as a president who would do more to support the wealthy, grow the economy and improve the stock market. The views are expressed in the wake of last week’s shocking vote by the United Kingdom to exit the European Union. Trump was on a two-day business trip to Scotland to promote two of his golf courses in the wake of the Brexit vote. As stock markets tumbled and world leaders scrambled to figure out the impact of the unexpected development, Trump’s speculation that the declining value of the pound “could very well turn out to be a positive” came off as flippant. Trump lost ground with independent voters over the last week and a half. He was up 9 percentage points over Clinton in a mid-June Morning Consult poll — 39 percent to 30 percent — that occurred before Brexit and his Scotland trip. Over the weekend, however, his support among independents dropped to 35 percent. Clinton’s support rose to 33 percent. About one-third of independents in both polls were undecided. In the most recent poll, the “don’t know/no opinion” figure for independents is 32 percent. Voters view Trump more favorably than Clinton in terms of wealth and economic growth. It’s worth noting, however, that almost two-fifths of respondents didn’t know or expressed no opinion on a variety of economic questions about the two leading presidential candidates. When asked who would do more to grow the economy, 45 percent of registered voters chose Trump, while 38 percent chose Clinton; 17 percent had no opinion. The difference between the two candidates was even more striking in terms of who would best represent the interests of the wealthy, with 51 percent of respondents choosing Trump and 33 percent choosing Clinton. Voters also chose Trump over Clinton in terms of boosting the stock market (46 percent to 32 percent) and creating jobs (43 percent to 38 percent). Clinton, on the other hand, has a decisive edge on Trump when it comes to representing the interest of regular folks, according to Morning Consult’s poll. When asked which candidate cares more about “people like you,” 42 percent of respondents chose Clinton, while only 34 percent chose Trump. Notably, on that particular question, almost one-fourth of voters (24 percent) didn’t know or had no opinion. 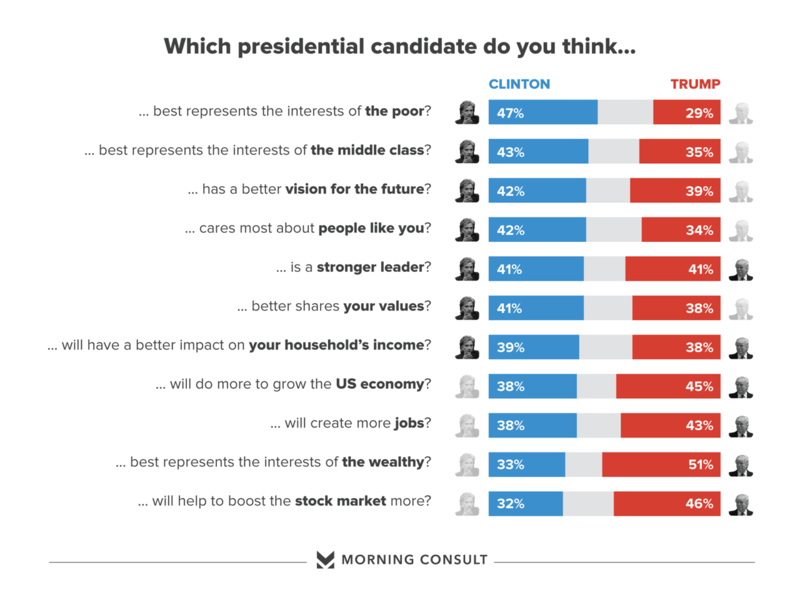 Voters say Clinton would do more to help the interests of the poor (47 percent) and the middle class (43 percent) than Trump (29 percent and 35 percent, respectively). Clinton has a barely perceptible lead over Trump about who would do more to help the respondent’s own household income, although 23 percent didn’t know or had no opinion. Almost four out of 10 voters (39 percent) said Clinton would do more for their personal household incomes, and 38 percent said Trump would do more. Clinton also has a slight edge over Trump when it comes to leadership and values. About four out of 10 voters (42 percent) say Clinton has a better vision for the future, compared with 39 percent for Trump. When it comes to which candidate better shares the respondents’ values, Clinton (41 percent) and Trump (38 percent) show similar percentages. They are evenly split at 41 percent on who is the stronger leader. The presidential economics poll was conducted June 24-27 among a national sample of 1,998 voters with a margin of error of plus or minus 2 percentage points. See toplines and crosstabs. The national tracking poll on candidate favorability and matchups was conducted June 24-27 among a national sample of 4,001 registered voters with a margin of error of plus or minus 2 percentage points. See toplines and crosstabs.